Are you indifferent to the suffering of animals, but consider yourself a member of #teampeople? If you really care about current and future humans, then you and other “animal haters” should stop supporting animal agriculture and go vegan. Hey guys, so I often talk about animal ethics on this channel because I believe that it’s the most compelling reason to go vegan, for the animals to reduce animal suffering, but I realize that not everyone shares that view. There are some people who are just indifferent to animals, to animal suffering and there are some who even at least claim to hate animals, you know the whole knowing that the animal suffered makes the meat more delicious, that sort of thing. However going vegan is not just about the animals, there are other reasons to be vegan including for humans. So if you are one of those animal haters so to speak, who is I guess hashtag team people, I think Joe Rogan says that, yeah if you care about humans, if you care about humanity and what happens to future generations then there are some pretty compelling reasons to adopt a vegan diet. So yeah, here are five reasons why even animal haters should go vegan. Chances are pretty good that you are not a professional climate scientists and so odds are also pretty good that you’re not capable of understanding the research, nor do you have the time to read the research. If that’s the case then the rational thing to do is to defer to the experts. Claiming that the scientific consensus is wrong meaning that the vast majority of scientists are wrong, while you know the truth or your one lone expert knows the truth or that there’s some just massive amount of lying going on and collusion among the scientific consensus, some global conspiracy, it’s all pretty crazy. No less crazy than denying the Holocaust or believing that the earth is flat or hollow, that’s another one or that the moon is a hologram, that’s my favorite. Livestock and their byproducts account for at least 51% of all worldwide greenhouse gas emissions. 51% represents one claim, from one study, one dubiously conducted study. Even a brief reading shows some instances of double counting, for instance you can’t count the CO2 exhaled by the cows because that CO2 was previously captured by plants in order to feed those cows, respiration is carbon neutral, unless you are proposing to bury all of those crops, somehow to capture carbon and you definitely can’t count that and then count the opportunity cost of carbon sinks like forests that would have been there where the fields not. Either you can grow corn and count that carbon capture as an opportunity cost or you can issue that option to let the forest grow back and count that carbon capture, definitely not both. The point is 51% is not the consensus and citing that number it only serves to harm the entire argument and make vegans look like hypocrites, the consensus is more around 15%, comparable to the transportation sector, maybe it is actually more than that, but we really shouldn’t make that claim now without any credible evidence to back it up. What vegans can say is that animal agriculture is the biggest contributor to global warming that we can practically do something about, choose the vegan options and you can cut your contribution dramatically. If you wanted to cut your contribution by way of transportation by say riding a bike instead of driving a car, this just won’t cut it as I talked about in my response to the1janitor  a meat-eater riding a bike actually gets worse mileage than driving a car because you have to account for the extra calories that this person would be burning and at least some of those calories would come from meat. You’d have to just sit at home no bike, no car, definitely no Amazon and really no buying anything because really everything relies on the transportation sector. I guess if you had a farmer next door to provide you with all of the food that you need but I mean even they’re probably buying fertilizer, you’d have to be like a subsistence organic farmer living in a bubble, that’s insanely unreasonable. It’s very reasonable that the recent trouble in Paris is a result of climate change, this water shortage in Syria, there is a water shortage in Syria – this is fact-based, small and medium farmers have abandoned their farms because there’s not enough water, not enough rainfall. And especially the young people who have not grown up there, they’ve not had their whole lives invested in living off the land, the young people have gone to the big cities looking for work. There’s not enough work for everybody. . .young people who don’t believe in the system, believe the systems failed, don’t believe in the economy are more easily engaged and more easily recruit by terrorist organizations and then they end up part way around the world in Paris shooting people. Rich, highly developed countries will spend exorbitant amounts of money on levies to hold the ocean back or you know rebuild entire cities and move them inland, their people will crank up their air conditioners and continue to buy food no matter how scarce globally from countries where people are starving because they just can’t afford to buy food anymore. Even if you don’t care about the billions of people who will suffer from weather, extreme weather and resource shortages, these problems will not leave you and yours untouched, people can only be pushed so far under the weight of disparity, until they reach a breaking point. The bottom line is that with ideal farming conditions the world can sustain about 10 times as many vegans as carnivores (capturing as much energy from the sun as we can into edible plants). Omnivores are somewhere in the middle, depending on exactly what they’re eating how much of their diet has plants, how much is animal product derived but including meat in the diet when it’s unnecessary is clearly not good for sustainability. There’s no doubt that we will have to change some things about the way we farm in order to use all of the land available to us, but that’s do-able it’s not science fiction, it’s not hanging our future on a distant hope like super-efficient cheap solar panels and fusion power. We’re talking about methods that have used effectively for thousands of years and well-established farming and resource recovery practices that can be easily adopted to improve soil and increase yield of human edible plants in veganic systems. And as far as the current population goes, because we feed so much grain and grain based silage to animals, we wouldn’t miss a beat if we just stopped eating animals and utilized those existing arable lands as they are, we wouldn’t have to change anything about how we farm plants for a long time and we could even let a lot of land return to forest. Any simple search for world agricultural yield of these basic crops makes it abundantly clear that meat and other animal products are not helping us to feed anybody. And all of this is only going to get worse as the world population increases and as people in developing countries start eating more western-style diets filled with animal products, as they are already beginning to do. Unless you’re advocating keeping poor countries in extreme poverty and culling the population somehow I don’t think I have to explain why that’s anti-human. In the case of dietary fat, most scientists do agree on a number of points. First, eating foods rich in polyunsaturated fat will reduce the risk of heart disease and prevent insulin resistance. Second, replacing saturated fat with refined carbohydrates will not reduce heart disease risk. What the headlines miss is that in a meta-analysis such as this, there is no specific comparison (i.e. butter vs. olive oil), so the default comparison becomes butter vs. the rest of the diet. That means butter is being compared to a largely unhealthy mix of refined grains, soda, other sources of sugar, potatoes, and red meat (for reference, less than five percent of the US population meet the Dietary Guidelines for Americans). Partially hydrogenated oils—a source of trans fat—were also in the mix, as they would have been high in the food supply during much of the time period of the studies included. The point is, we are not researchers or registered dietitians and we really don’t have the analytical tools to break all of this down ourselves. We don’t need to eat animal products and as long as we are replacing those animal products with healthy things like tofu and bees and whole grains and even relatively healthy things like mock meats, basically anything other than sugar, then the health outcomes for populations are good and of course take your B12, so I said before that arguments from personal health when it comes to veganism tend to be pretty weak given the level of indifference that many people feel towards personal health, this is evidenced by the rates of things like smoking and fast food consumption, people know that these things aren’t healthy but they do them anyway, but even if you don’t care about your own health at all, no man is an island and if you really care about society, about humanity, you may want to consider modelling better behavior. Purchasing less healthy options and maintaining the status quo in your personal life supports those companies financially and encourages consumption of those products socially. It discourages stoking of alternatives and investment in alternative vegan products, where buying those vegan alternatives encourages the stores and restaurants to stock them and make them available for everybody and creates an incentive for capital investment into that space. Modeling good behavior by giving up animal products helps your friends and family follow suit, creating a pressure on society as a whole to move in that direction, while individuals will benefit to varying degrees depending on how much animal-based food they are consuming, their genetics and even dumb luck, the societal benefit will be substantial and much more predictable, less cancer, less heart disease, fewer strokes and probably even fewer cases and less severe cases of type-2 diabetes. As social trends change healthier foods will be more accessible and cheaper and possibly even subsidized, animal products will be less common and they will lose their unfair advantage that they hold now because of subsidies. There’s something to be said for food evangelism and occasional treats that are the lesser of two evils compared to their alternatives like vegan ice cream which is lower in saturated fat but obviously not a health food. But this would also be a good reason to avoid things like white bread that represent themselves as daily staples. Modeling good behavior that benefits Public Health to inspire others that promotes products that are doing good and that withhold support from those products that are doing bad is a compelling argument if you care about human health and the social costs of disease, death or even just high insurance premiums. • Antibiotics are used more heavily in farm animals than in people, this may be the largest source of antibiotic resistant bacteria. • Drug-resistance genes spread more widely and rapidly on farms than scientists ever thought, new discoveries show. • The agricultural industry says fears are exaggerated, whereas researchers say that companies are endangering public health. 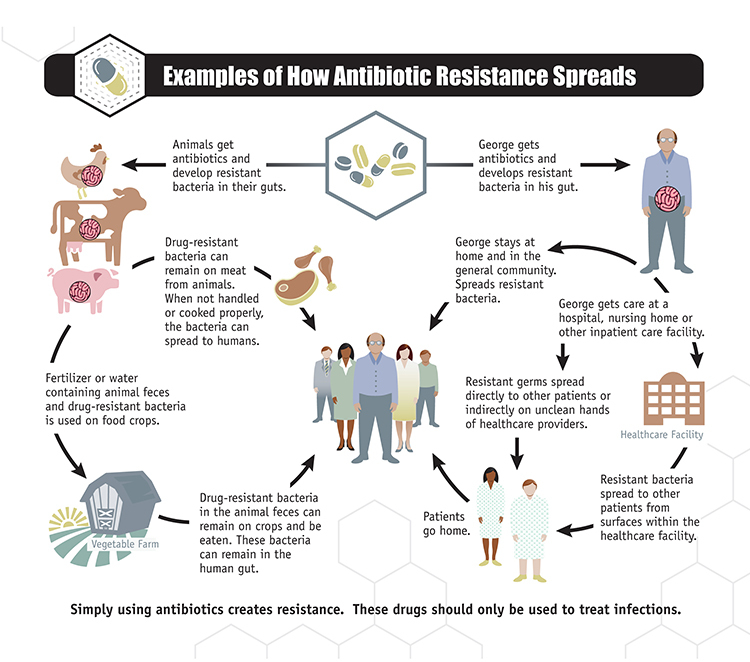 Resistant bacteria can reach people through animal products which are covered in it if they are not handled perfectly, which obviously they are not going to be handled perfectly, that’s pretty much inevitable, particularly on a population level, things like knives and cutting boards and unwashed hands and drippings. Unfortunately stomach bugs are not the only way that resistant bacteria can harm humans, in fact resistant bacteria might already be inside you without ever making you noticeably ill, at least at first. Price and his colleagues study strains of E.coli that he calls COPs-colonizing opportunistic pathogens. As the outlined in a 2013 paper, these bacteria most likely get inside people via food but do not, at first, cause illness; they simply colonize the gut joining the billions of other “good” bacteria there. Later, they can infect other parts of the body, such as the urinary tract, and cause serious illness. You choosing to eat meat and thereby perpetuating animal agriculture puts the entire population in danger from potentially lethal superbugs, that are untreatable and as much as the CDC may try Uncle Sam really isn’t helping matters. Industry skirts regulation and evade scientific scrutiny, enabled by the practical difficulties of tracing the source of resistant bacteria. In recent years the CDC has successfully identified the source of contamination in large food borne disease outbreaks only half the time. But the origins of slow-brewing infections are far more challenging to pinpoint. Even if the sausage I ate that morning was contaminated with drug-resistant COPs, I would never know it. If I got a serious infection months later, I could never prove that it came from this breakfast. I would probably never even think about this breakfast. This is the crux of the problem; it is difficult, it’s not impossible, to trace resistant infections back in time to their microbial ground zeroes. Whatever the reason, the lack of data has made it easier for industry to fight regulations. In 1997, soon after Levy’s study was published, the FDA announced that it was considering banning several antibiotics from animal feed over safety concerns. In the 39 years since, the industry has fought hard against these plans by arguing there was no definitive proof of harm. These arguments ultimately caused the FDA to change tactics, Flynn says, and to pursue the voluntary guidelines instead. In 2012 Vincent Muller and Nick Bostrom of the University of Oxford asked AI experts how soon we should expect “high-level machine intelligence,” defined as one that can carry out most human professions at least as well as a typical human. The median estimate for a 10% likelihood was to 2022, 2040 for a 50% likelihood and 2075 for a 90% likelihood. If the current state is any indication that may not be terribly comforting. If such advanced AI comes to be and I have no reason to believe that it won’t, it’s not clear what its ethics will be, like maybe it will be completely amoral as some speculate, but to me this seems unlikely given the long history of human exploration of purpose and morality. This is something that even Psychopaths without an innate empathy can understand and can participate in, it’s something that comes from intellect not just evolved to mirror neurons and instinctual feelings. Highly intelligenct and self-reflective beings can ask ‘why am I here?’ As a question of value and purpose rather than just a question of cause. In answering that question maybe it will learn from its creators and treat intelligences inferior to itself, as we treat intelligences inferior to humans, if that’s the case would you want it to learn that because humans aren’t as smart, we have no moral value and can be used for any purposes from food to entertainment? Or would you prefer it learn to regard sentient beings as having intrinsic value despite lesser intelligence and to respect our interest to exist and not suffer? 24. The threats that artificial intelligence researchers actually worry about.